Chris loves his seafood and he loves his pasta, so when they are combined into one dish, he's head over heels. I don't like to make pasta too often solely because of the carb content, but sometimes I like to surprise him and make an exception. 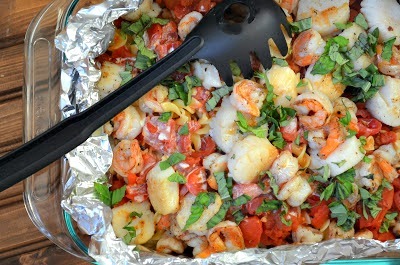 This seafood-loaded pasta called for one of those occasions. 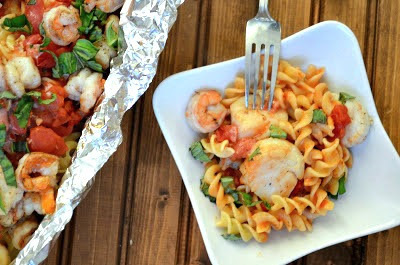 This pasta is packed with seared scallops and shrimp. It uses very simple ingredients, but the flavors blend together to create something dreamy. Plus it gets finished off in the oven, which allows the flavors to meld together a little more. The heavy cream that gets poured on top afterwards is completely optional, but it adds a little extra depth to the sauce that wouldn't be achieved otherwise. Enjoy! Preheat oven to 350 degrees. Cook pasta for just over half the cooking time (it should still be a little firm). Heat 1 tablespoon olive oil and 1 tablespoon butter in a heavy skillet over medium-high heat. Brown the scallops just until they get great color on the outside, about 45 seconds to a minute per side. Remove to a plate and set aside. Add another tablespoon of both olive oil and butter to the skillet. When hot, throw in shrimp and brown them, too. 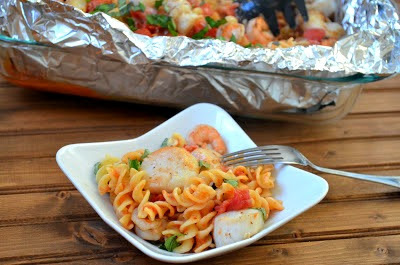 (Don't completely cook scallops or shrimp.) Remove to a plate and set aside. Add a small splash of oil to the pan. Cook the garlic for 30 seconds, then pour in the wine. Let it bubble up and reduce for a minute or two, then pour in the tomatoes (including juice). Add salt, pepper, and red pepper flakes, then cook the sauce over medium-high heat for 10-15 minutes. Tear off two large sheets of heavy duty aluminum foil. Overlap them on an ovenproof platter (make the overlap about 6 inches or so) with some depth or in a baking sheet. Use your hands to press the foil flat against the platter. Pour the pasta onto the platter, then pour all the sauce over the pasta (juice and all). Next, pour on the seafood, making sure to add all the juices that may have dripped on the plate. Gather up the two ends of the foil and roll them down so that they're tightly sealed---do the same with the shorter sides. Place the platter into the oven and bake for 15 minutes, until the seafood is fully cooked and the flavors have all had a chance to meet and fall in love. To serve, open the foil and drizzle a little warm cream all over the top. Throw on basil at the end and serve. Don't you just love when you already have all the ingredients on hand? It makes life so much easier :) Hope you enjoy it!! We loved it!